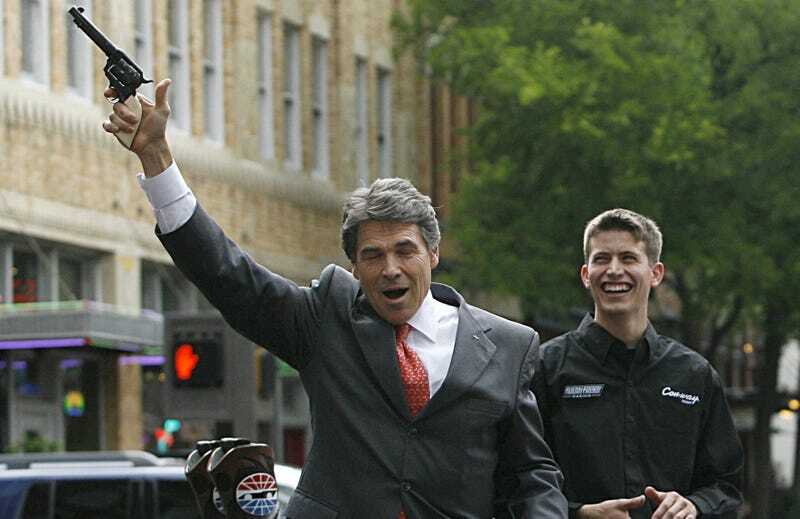 Rick Perry, a swaggering idiot who found a pair of glasses on the street one day, is about to become the head of the Department of Energy, according to CBS News. The Department of Energy’s job right now is to develop the next generation of nuclear weapons. What this means practically speaking, of course, is that we are spectacularly and incontrovertibly fucked. The former Texas governor sits on two corporate boards - one of them is Energy Transfer Partners - and that may present a confirmation issue. Energy Transfer Partners has a subsidiary known as Dakota Access LLC, which is attempting to build the Dakota Access Pipeline. And how does that compare to the current Secretary of Energy’s qualifications? Ernest Moniz, a former professor at MIT, “served as Head of the Department of Physics and as Director of the Bates Linear Accelerator Center. His principal research contributions have been in theoretical nuclear physics and in energy technology and policy studies.” So, you know, basically the same thing. Now, none of this would be as big of a problem if Obama hadn’t just agreed to a a massive modernization program of our existing stock of nuclear weapons. This program is going to cost somewhere in the range of $350-450 billion and take about ten years. And our big, dumb boy Rick Perry gets to kick the whole thing off, as he’s now responsible for the design, testing, and production of all nuclear weapons. How hard can it possibly be. Anyway, Rick, what’s that department you’re about to be heading up again? Haha, that’s right. We’re all going to die.